Unless I'm already senile, today is April 9th, 2014. On 03/27/2014 at 01:18 PM, I placed an order with the mint for some of the new Baseball Hall of Fame coins. Note: "Expected to ship on 04/03". Today is the 9th. So I called them. I had a pleasant fifteen minutes on hold and then spoke to a very nice woman who explained that nothing is wrong, they are just overloaded with orders. All will be on its way "soon". That's all she could tell me, but she was very pleasant about it. So, someday, someday "soon", I will get these coins and that will be the end of my fretting, right? No, dammit. My troubles just begin when I get the coins. What to do with them? Prices have been steadily rising for the few that are already available (mostly bought directly at the Mint offices or at the recent Baltimore coin show), but I expect the price to dip when people like me start receiving our orders. Should I sell, should I hang tight for later profit, or should I just hang on and pass them on to my kids someday? Nor is that the only decision to make. Should I have these certified by PCGS? 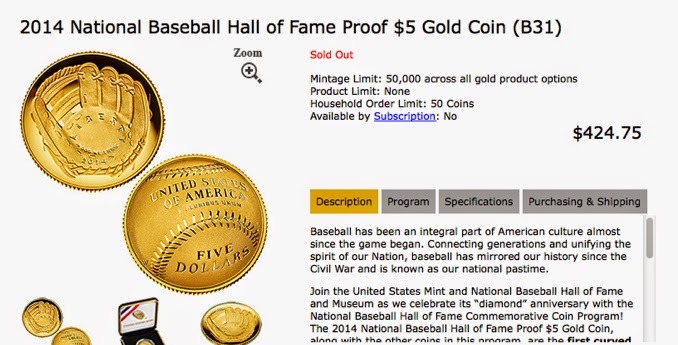 Certified coins usually sell for more and are easier to store than those in OGP (Original Government Packaging), but that neglects the crossover appeal: baseball aficionados may prefer the OGP. I mentioned that the price could drop. The mintage of the gold and silver is limited and they are both sold out, but if a lot of people bought to sell, it is possible for these to descend below original cost from the mint. That's especially true for the gold versions as gold prices have been trending downward recently. If that happens, these are definitely heading for the safe deposit box and my children.